Over the past few years, there has been a marked increase in interest about gender diversity and transgender issues across the community and media. What does this mean for young people and their families? Drawing on his experience, Associate Professor Stephen Stathis will explore the definition of ‘gender’, the concept of gender diversity, and the complexities in assessing and supporting children and adolescents who present with questions about their gender identity. Stephen has dual fellowship in paediatrics and psychiatry, with certificates in Child & Adolescent Psychiatry and Forensic Psychiatry. He is the Medical Director of the Child and Youth Mental Health Service at Children’s Health Queensland, and Clinical Advisor to Queensland Health for child and youth mental health. 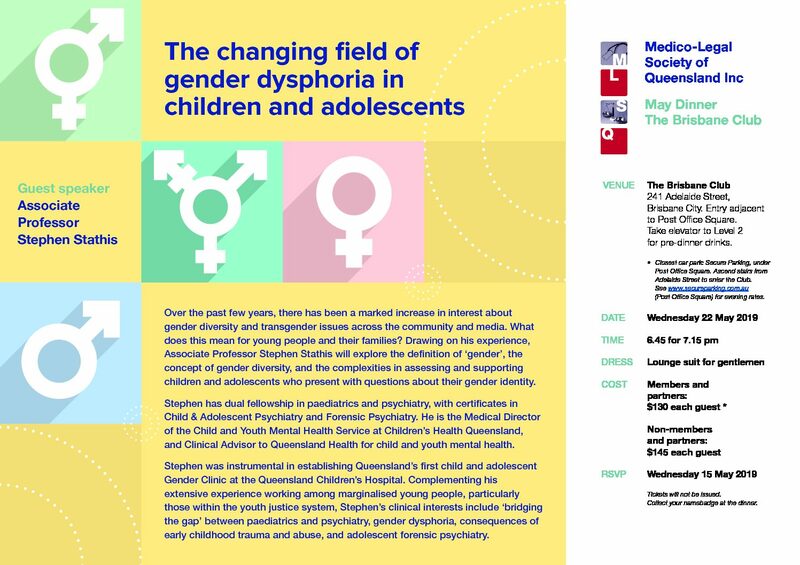 Stephen was instrumental in establishing Queensland’s first child and adolescent Gender Clinic at the Queensland Children’s Hospital. Complementing his extensive experience working among marginalised young people, particularly those within the youth justice system, Stephen’s clinical interests include ‘bridging the gap’ between paediatrics and psychiatry, gender dysphoria, consequences of early childhood trauma and abuse, and adolescent forensic psychiatry. VENUE The Brisbane Club 241 Adelaide Street, Brisbane City. Entry adjacent to Post Office Square. Take elevator to Level 2 for pre-dinner drinks. Tickets will not be issued. Collect your namebadge at the dinner.